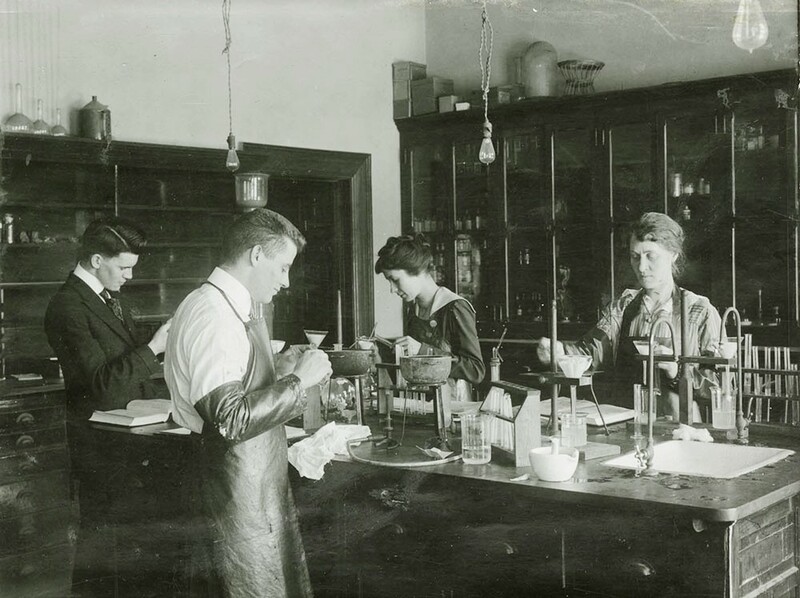 Women work side by side with men in early WSC chemistry lab. At a time when women were often not even accepted to colleges in the eastern United States, Washington State College (now WSU) welcomed them. After all, there weren’t that many people clamoring to go to college in the remote West. A new exhibit at the school’s library in Pullman features some of the university's "women of distinction." Among them: Josephine Hopper Woods, the daughter of German immigrants who earned a degree in pharmacy in 1899, then shifted to chemistry, and went on to become the school's first woman to earn a graduate degree in 1908. Neva Martin Abelson graduated in 1934 with a degree in chemistry and went on to earn a medical degree from Johns Hopkins University, and in 1942, she and Dr. Louis K. Diamond developed the Rh factor test that’s used to screen all pregnant women to this day. “Ambitions and Intellect: Pioneering Women at WSU,” runs through June in Manuscripts, Archives and Special Collections in the Terrell Library at WSU. Hours are 8:30 a.m.-4:30 p.m. Monday-Friday. C’mon kids! Learn to fail! It’s spring and that means area high school seniors are receiving acceptance letters (or that surely undeserved rejection) from colleges and universities. But are even highly successful high school kids prepared for the rigors of scientific study in college? "Many students who began science degrees with me switched to other majors the first time a project failed. One failure and they were gone," writes Sara Whitlock in an essay on StatNews.com. Whitlock says our national scientific endeavors will suffer if college students don't learn to deal with failure. Have a bike you no longer need? Donate it to the Spokane Bike Swap and Expo by April 7. Children’s bikes are especially needed. Or, for $5 you can also register to sell your no-longer-needed bike (an 8 percent consignment fee applies to sold bikes). But the Swap and Expo may be best for those in the market to buy. Organizers anticipate there will be more than 700 bikes to choose from. Last year’s event raised $36,000 for the Friends of the Centennial Trail. Find more about donating and selling bikes, as well as opportunities to volunteer at the event which occurs on April 8, at the Spokane Bike Swap website.